Discussion in 'Downhill & Freeride' started by wood booger, Apr 26, 2013. Oh boy, it's going to get expensive. Nice but I don't really understand. First work with cane creek and then go with your own shock? Kindof funny looking with the piggyback being sideways. Just because Ohlins is testing it does not mean that they wont co-produce it with Cane Creek. No poppet valves no care. But seriously, that's an interesting way to address some possible shock - frame fit issues. I was thinking it would be more of a fit challenge with the reservoir extending past the eyelet. Looks very cool, will it be as the same as CC DB tho? 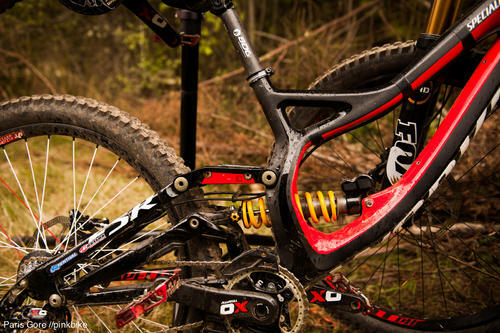 Ohlins licensed their "old" technology to Cane Creek for the DB, they keep the cutting edge stuff on lock down. This is the real deal stuff straight from Sweden. Should have all the goods such as a bladder instead of IFP, easy to play around w/ shim stacks, etc. I think you are right. That is going to be a fitment nightmare. define etc. isn't DVO offering the bladder and easy shims tuning on their shock? Another possibility would be that it's something developed by Specialized themselves... Kind of like the crap they used to have on the Enduros. That does not fit a Sunday, even with the Bos link, i am pretty sure of that. I wouldn't be so sure. Ohlins' cutting edge stuff is still their TTX stuff, which has a solid shaft - yet this one has a rebound adjuster at the bottom of the rebound shaft. I'd say it's more likely a Spesh item (possibly in collaboration with someone else outside the bike world) with a yellow spring to get people's attention and get them talking. I have no insider information on this though, maybe Ohlins really are taking a step backwards from the CCDB to help Specialized develop something. The TTX stuff isn't a hollow shaft. It's got a needle adjuster in there that meters compression flow equally to rebound flow. There's also a shaft jet in the bleed port to size it down. Shifts the entire damping range in both directions. In the fork cartridges it's just got a normal rebound adjuster in the shaft. It's one super tiny hollow steel shaft though in those things, and they suffer from the same lack of support issues that the CCDB's have. Zero progressiveness to the damping, but ultra slick feel and controlled on the smaller stuff. I know but i talk about retail sale, anything that you can purchase from CRC. Maybe it's going to be a proprietary Specialized shock and they don't care if it doesn't fit on bikes other than the Demo. or they're testing and production may change. or it may never see production. WHAAAAttt? Specialized/Ohlins don't care if the shock they develop fits an out of production bike? What is the bike industry coming to? Friend of mine snapped this at one of our bike parks this last autumn. Öhlins tech-van was there (they rented the whole park) and so was Brad B and some other Spec-people. Check out the data acquisition gear on the Demo in the background. They'll turn the piggy back around for production, I betchya. Weird I am shocked they are even looking at the MTB market. They are not a major off road player but I would think it would not really be economically feasible to spend time and money on something that say under 1000 will be made a year. That was SHOWA's main problem with the bicycle market it was just so small it didn't pencil out for them. The mtb-market is growing and they know as well as I that there are many people out there who will pay for that stuff. But I think they are gonna release it also as an all-mountain/enduro-shock to really see some sales numbers. To me it looks like either specialiced wants to make a proprietary shock to the ccdb (which would make sense since fsr isn't an exclusive marketing-factor anymore) or ohlins wants to step into the mountainbike sector and use spec for it. That is indeed Ohlins logo (horizontal) on the right barrel. Looking at their products on their homepage it was pretty obvious it was an Ohlins, the bridge, sideways piggyback, spring color etc. I think they even had a test session at bike park here in sweden last year where they had rented the whole park for themselves. Man I would be proud if i could for once put a domestically produced product on my bike and an Ohlins to boot. Now we need a fork/cartridge. damn, you guys are good.. i cant even see that when i look at the image all zoomed up close. And then thats leads to the question, why bother putting the logo on the shock and then tape it out? Unless its pretty close to being mass produced.. Sorry, you are correct, it's been a while since I had a good look at those. At any rate though, this would appear to be sacrificing the independent HSR/LSR the CCDB has, which is what made me somewhat skeptical that it's an Ohlins unit. Would be cool if it was though. Some of the pics in that other thread seem to be more convincing too. I gotta say that all of this is weird, but not surprising. Luca and Walker Shaw's pop works at Ohlins USA here in Asheville/Hendersonville. Them both being on Specialized is awfully convenient for everybody on both sides of that fence. More precisely, he is the President of Ohlins USA. It's all about keeping it in the family. He's got some damn fast kids too! I'm gonna have to step in here and stop this speculation before it gets out of hand. The relationship between Specialized/the Shaw boys sponsorship and their fathers position at Öhlins USA has absolutely NOTHING to do with the pictures posted here. I can certainly see where one would come to that conclusion, but it is simply not true. Sincerely, an employee of Öhlins USA. Can we get the important non speculatory information about the shock instead?